Several of the biggest surprises for the Egyptian-German Mission were discovered in area 221. In the spring of 2015, the team was able to start the archaeological examination of this particular area, located on top of the western enclosure wall of the temple’s innermost precinct. 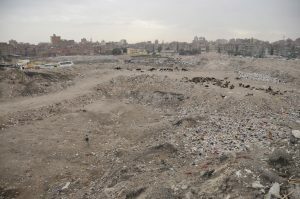 Since the archaeological sequences were literally buried under mountains of garbage – reaching heights up to 13 m – a large-scale waste disposal had to be implemented at first. Thanks to local facilities, it was possible to work below the water table. 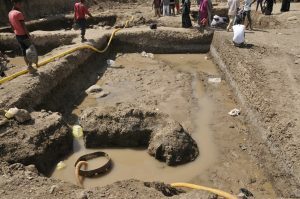 Soon after the excavation had begun, the mission unearthed a large amount of big stone fragments, all bearing evidence for the former existence of sacred buildings. About 70 cm below the water table, many hieroglyphically inscribed basalt slabs from the reign of Nectanebos I (380 – 362 BC) were discovered. Their decoration shows sections of a geographic procession: Each of the inscriptions deals with a certain nome of Egypt and the local cult topography with (the most) important gods and cult places. As the state of preservation on the bigger fragments indicates, every textual description of a nome was initially accompanied by a depiction of the kneeling personification of fecundity/the Nile flood. The inscriptions are mainly addressed to Atum, Lord of Heliopolis, but also mention the Heliopolitan Hathor, mistress of Hetepet. Moreover, at least two different gates from Nectanebos I can be distinguished so far. Silicified sandstone from the Gebel Ahmar – near to present-day Cairo – was used for loadbearing elements, such as the gate’s door posts or lintel. The mission’s most formidable challenge – the extrication of a huge fragment of the gate weighing about 13 tons – was met with the kind support of the company Liebherr as arranged by Arab Contractors in the autumn of 2016. By lifting the remaining fragments, it was revealed that several stones were decorated with depictions of Atum and the king himself offering to the god. Furthermore, fragments of decently worked limestone columns point to the existence of a kiosk of Nectanebos I. This kiosk appears to stand close to buildings of the New Kingdom. 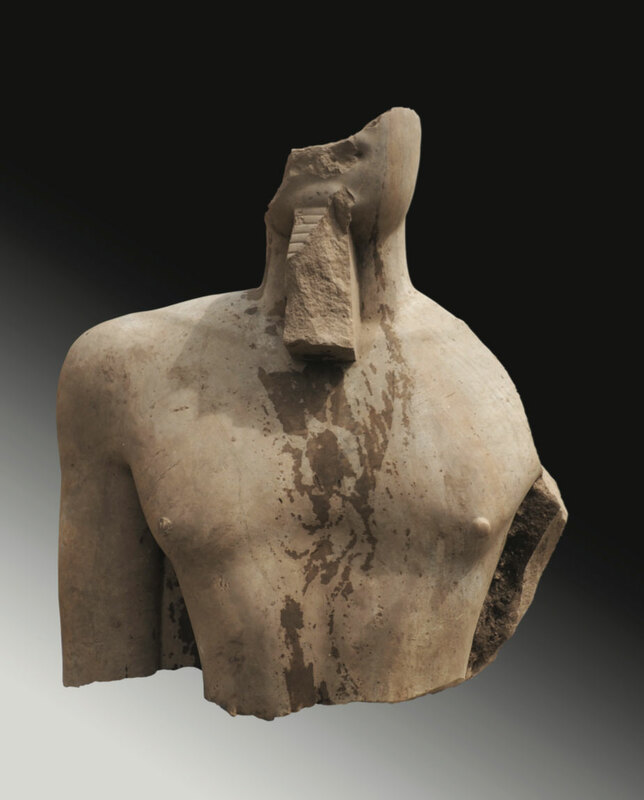 Among others, two fragments of red granite, belonging to a larger than life-size statue of king Merenptah (1213 – 1203 BC), were discovered on the eastern fringe of the temple of Nectanebos I. These fragments show evidence of the biggest hitherto known example of this particular statue type: the lunging king in proskynesis. On the western limit of the excavation, fragments of column drums – initially measuring 118 resp. 186 cm in diameter – were found. At the northern access to the temple, the paw and the head of a colossal sphinx were also found. The remains of a sphinx are indicative of the existence of at least one more, or possibly even of the existence of an avenue of sphinxes, which could have led from the western gate to the obelisk of Senusret I. Furthermore, fragments of a gate from the reign of Ramses II (1279 – 1213 BC) were identified. The king himself is depicted many times. The fact that he is shown with an elongated khepresh-crown points to a construction of the temple late in his late reign. Different aspects of the sun-god Ra-Horakht(y) are also depicted. 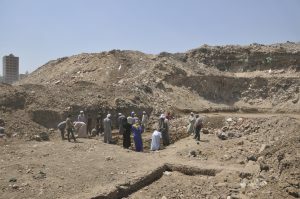 As there is a large amount of very important finds from the area, the mission is deeply grateful for being able to store the fragments in the Open Air Museum of Matariya.